Successfully saved Strawberry Nutella Cupcakes to your Calendar. You can also save the ingredients to your Grocery List. Strawberry, Nutella, and vanilla all in one! 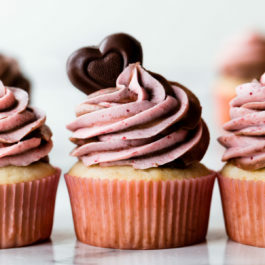 These Valentine's Day inspired cupcakes begin with my basic vanilla cupcake recipe. The two frosting flavors are made from 1 basic vanilla buttercream. These cupcakes are fun, festive, and definitely Cupid approved! !